When setting the value of an XML column, so-called ‘insignificant’ white space can be removed. Generally this is not an issue but if the white space is required there are a couple of ways to prevent this. OPENXML is used to produce a rowset over an XML document. It isn’t something I’ve ever used and it took a while to understand the use of flags that it can use. The following article contains several examples, using the various flag settings as well as an example of the metaproperty attributes. I tend not to use XML very often, so have limited experience with it. Whilst reading Itzik Ben-Gan’s (b|t) book for 70-761 I came across XMLNAMESPACES for the first time. The section on this aspect is quite brief, so this blog contains the additional work I used to ensure I understood it. I’m not a big fan of XML via T-SQL – far too long-winded a monster for my liking. However, there is no denying the usefulness of it and the fact that on occasions it simply doesn’t matter if you like an aspect of SQL Server, you may simply have to learn to use it. If I could pick and choose which bits I get to play with I suspect I wouldn’t be a DBA for long. One nice little ‘trick’ with the XML commands that I’m grateful for is used to provide a comma-separated list of data. It’s an interesting solution that is often shown to people who need such a thing and is far faster than other solutions I’ve seen. 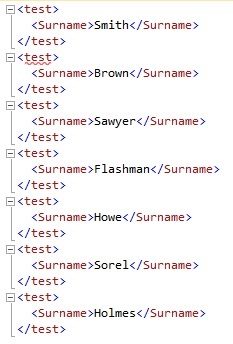 This is a very simple example of the XML command. Normally the PATH would have something within it and would therefore produce a very basic XML. Not valid XML in this form (hence the red underline) but you get the idea. The next requirement is to remove the leading comma and convert this back to a character field. This is where STUFF comes in. In this case the first parameter for STUFF is the XML query. Then it looks at the first character position of the query result and replaces the two characters from that point with a zero length field (”). 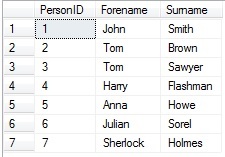 As STUFF returns character data or binary data depending upon the data type it is processing, in this case it returns the result as a character field, with the leading comma removed. Two problems solved with one command.